But, in the meantime, repaying those student loans can be a significant hurdle, not only for grads but the economy as a whole. 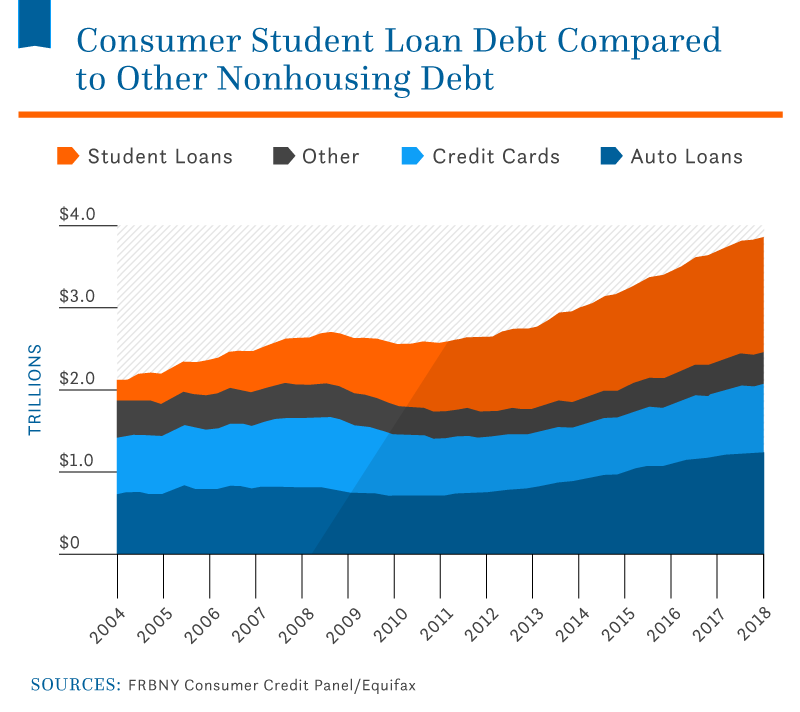 Here is a comprehensive statistical shaphot at the current state of student debt in the U.S. in 2019 – the challenges, trends, and a few encouraging indicators for the future. 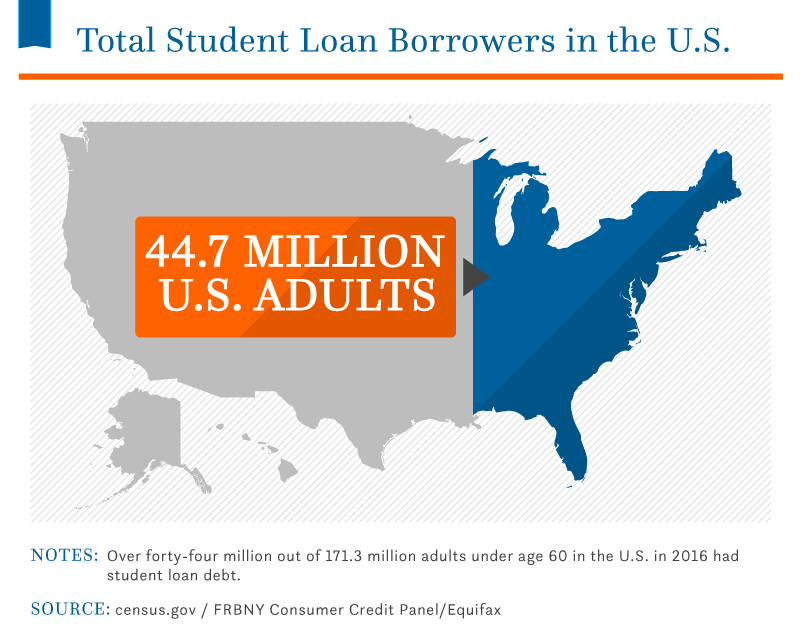 Average Student Loan Debt in the U.S.
Americans now owe more than $1.53 trillion in student loan debt, based on the most current figures available to Nitro. That money is not only owed by young people fresh out of college, but also by borrowers who have been out of school for a decade or more. The standard repayment timetable for federal loans is 10 years, but research suggests it actually takes four-year degree holders an average of 19.7 years to pay off their loans. How Much Is the Typical Student Loan Payment? 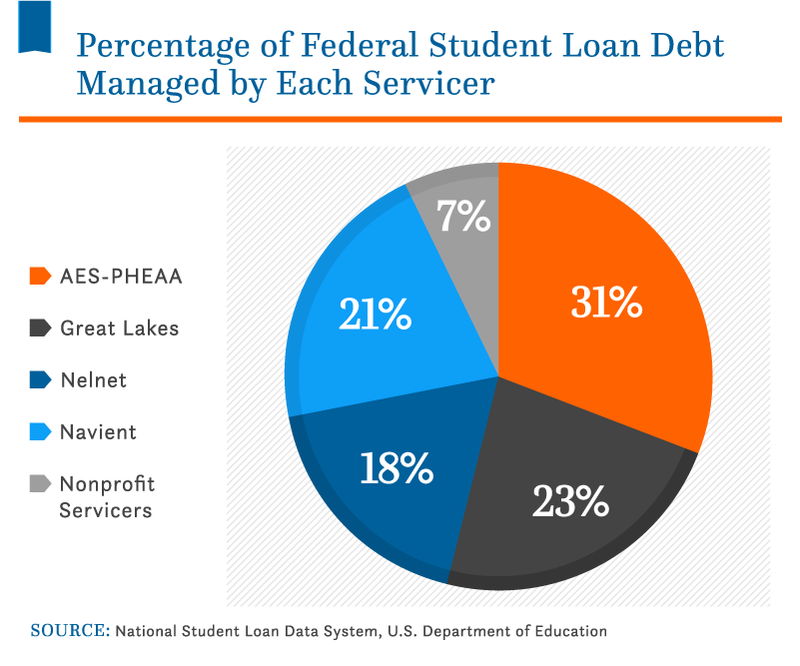 Who Services Federal Student Loans? Which Are the Most-Educated States? Which Graduate Degrees Are Students Borrowing the Most For? In the past decade, total U.S. student loan debt has surpassed credit card debt and auto loan debt. In the third quarter of 2018, Americans owed $840 billion on their credit cards and $1.21 trillion in auto loans. Currently, U.S. student loan obligations are larger than both, trailing only mortgages in scope and impact. Student loan debt has ballooned in the past few decades, primarily because the costs associated with higher education – tuition, fees, housing, and books – have grown much faster than family incomes. 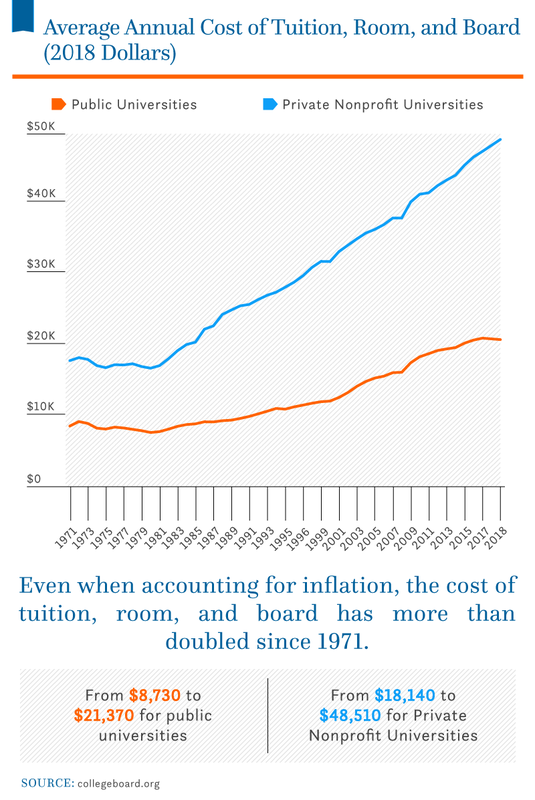 The College Board has tracked costs at public and private universities since 1971. When the organization first started monitoring prices, the average cost of one year at a public university was $1,410 ($8,730 in 2017 dollars). That was 15.6% of the median household income of $9,027 and manageable for many families without going into debt. Fast forward to 2018, and the picture is very different. Today, the average cost of one year at a public university is $21,370, which is 34.8% of the median household income of $61,372. That could be why more than 70% of bachelor’s degree recipients emerge from college today with substantial student loan debt, and why many find themselves in need of loan consolidation and refinancing. 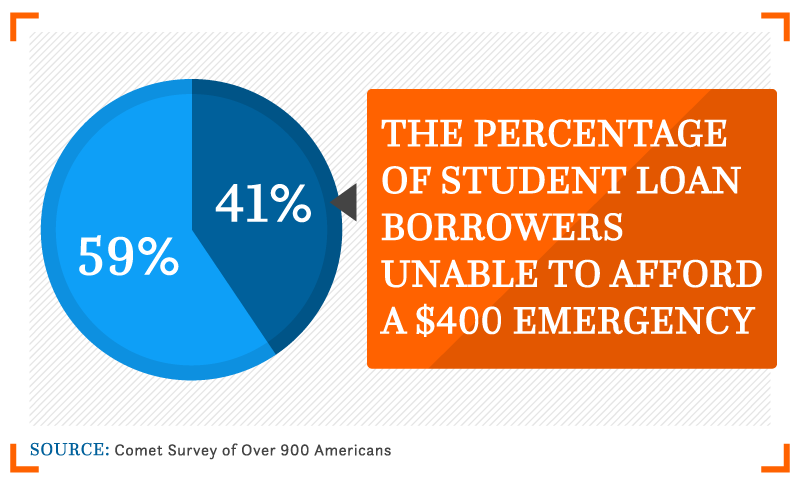 Student loan debt is a reality for more than 1 in 4 American adults. There are 44.7 million people with active student loans in the U.S., and the overwhelming majority of them are under the age of 60. The most recent figures from the U.S. Census Bureau estimated there are 171.3 million adults in America between the ages of 20 and 59. 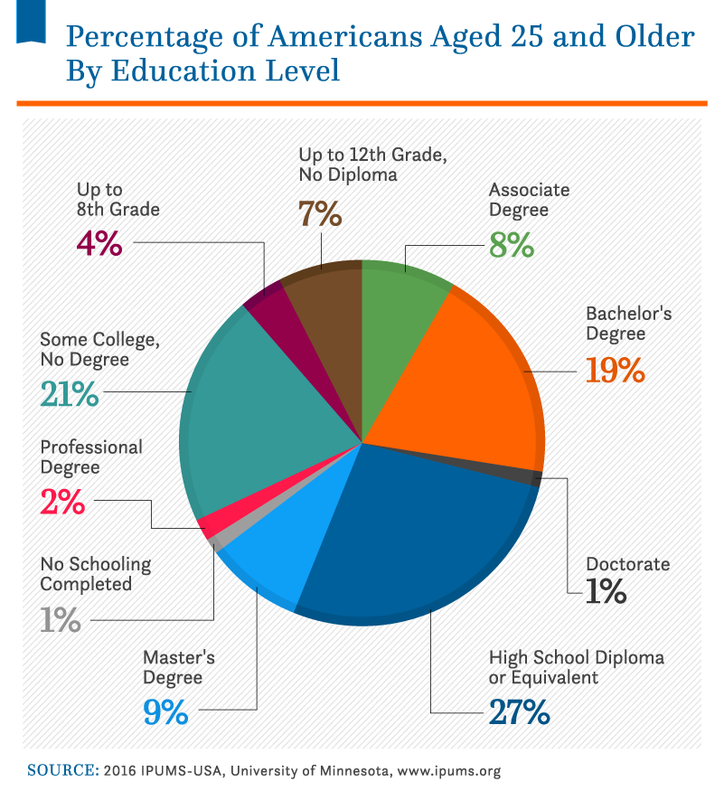 That means paying off student loans is a common challenge for 26% of younger adults under age 60. Today, bachelor’s degree recipients with student loans graduate with an average debt of $37,172. That’s up from $20,000 just 13 years ago. 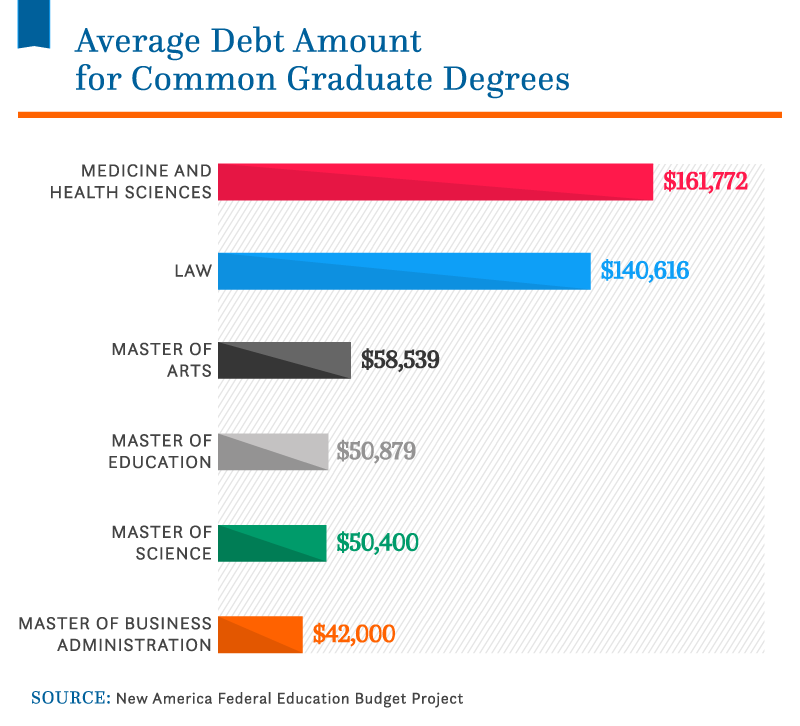 And the mean debt for all people with outstanding student loans is $32,731. To put it in context, we looked at what else you could buy with that sum. 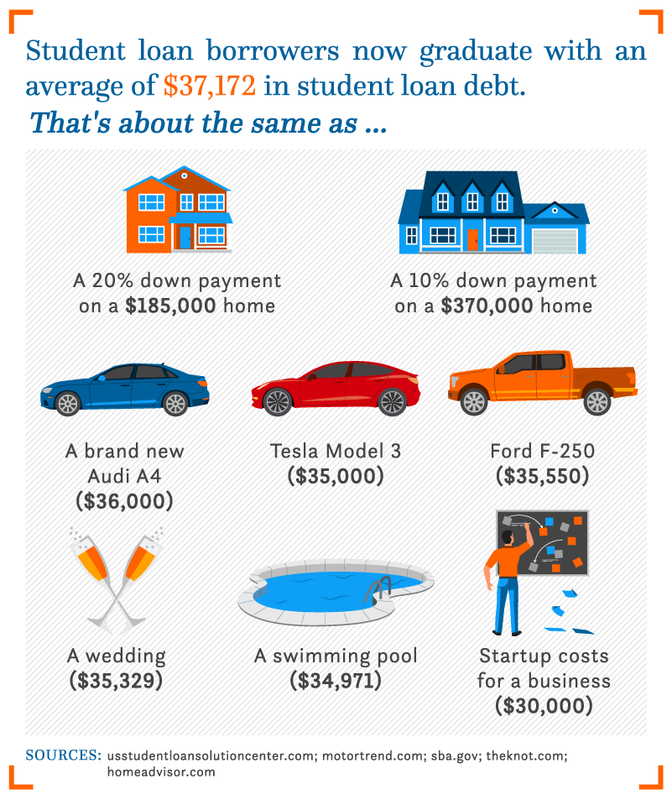 Today’s average student loan balance could buy a brand new Audi A4, pay for a 141-guest wedding, or score four 50-yard line tickets to the big game. It’s also equal to an 18% down payment on a $205,000 house – which was the median home value in the U.S. in November 2017. The average monthly student loan payment was $393 in 2016 (the latest data available), which is like buying the newest Apple Watch every two months. That puts the average monthly payment nearly 55% higher than it was a decade ago. Student loan payments have increased more than two-and-a-half times faster than the rate of inflation. 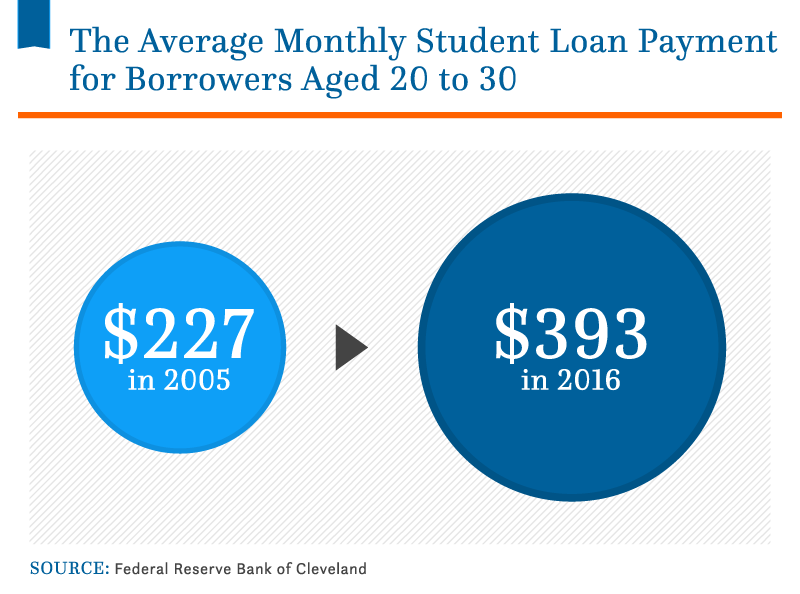 If the typical $227 monthly bill student loan borrowers received in 2005 had kept pace with consumer prices, the cost would only have risen by 22.9% to $279. Paying off student loans is significantly more challenging today than it was in the past, but there are strategies borrowers can use to cut their interest rates and lower their monthly payments. One of the effects of student loan debt is many borrowers have no financial safety net if they get hit with an unexpected expense. In a recent Nitro survey, 41 percent of people with student loans said they wouldn’t be able to afford a surprise bill of $400. Even fewer could handle a home repair or medical emergency, which can run into the thousands of dollars. It’s hard to quantify the impact of this financial uncertainty, but money worries can take a heavy toll on health, work performance, and relationships. Most Americans try hard to meet their student loan obligations, but as balances grow, a greater number of borrowers are falling behind on their payments. 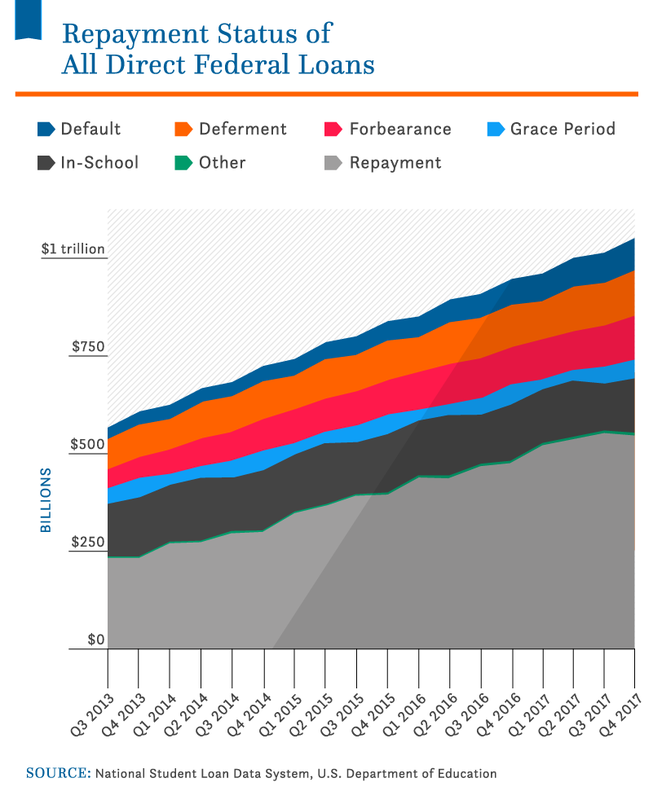 Student loans now have the highest rates of delinquency. At the third quarter of 2018, 11.5% of student loans were more than 90 days past due. 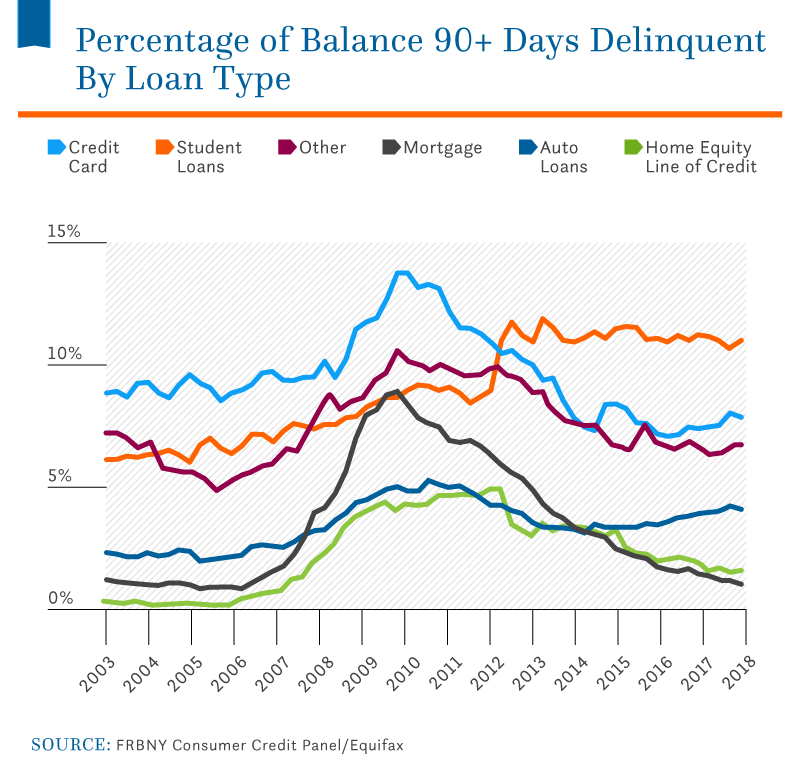 In contrast, the credit card delinquency rate stood at 7.9% and the auto loan delinquency rate at 4.3%. Home equity line of credit (HE revolving) and mortgage delinquency rates were even lower, at 1.2% and 1.1%, respectively. The challenges of repaying student loans may be, in part, because of high interest rates. As more graduates discover private refinancing options, which can lower monthly payments significantly, delinquency rates may fall. 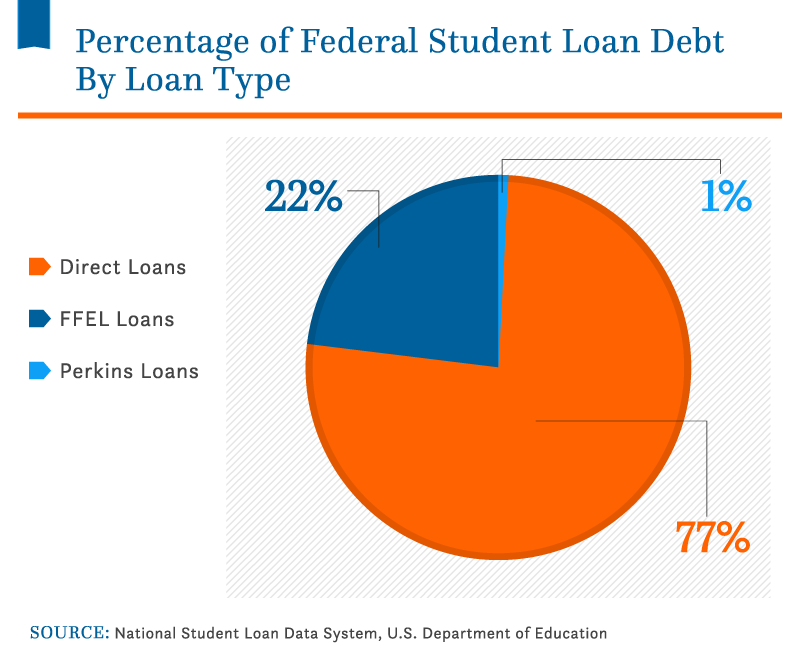 The overwhelming majority of outstanding student loan debt is owed to the federal government. The remaining 19% is owed to private banks. Historically, federal loans were the first stop for most students because they were relatively easy to get and carried reasonable interest rates. However, as market conditions have shifted from the early 1990s until today, so have the interest rates on federal student loans. In recent years, new competition among private lenders has led to more options and better customer service. Especially after graduation, many students find they can get a better deal by refinancing federal loans with private lenders. Over three-quarters of all federal loans are direct loans. They are provided directly by the U.S. Department of Education and are available to most students regardless of financial need. Federal Family Education Loans (FFEL) are indirect loans, provided by accredited institutions but guaranteed by the government. Perkins Loans are need-based loans of up to $5,500 a year for undergraduate students with very low household incomes; they are issued directly by the universities. Federal loans are among the easiest for students to get, but most have low annual limits, and interest rates can be high. Graduates with multiple federal loans can turn to consolidation to streamline their finances and lock in lower interest rates. Forbearance and deferment enable many borrowers to postpone payments if they are experiencing economic hardship, like unemployment or a medical crisis; are serving in the military; or are continuing their studies through a fellowship, residency, or postgraduate study. The main difference is that interest always accrues during forbearance, but does not during some deferments. Who Services My Federal Student Loans? 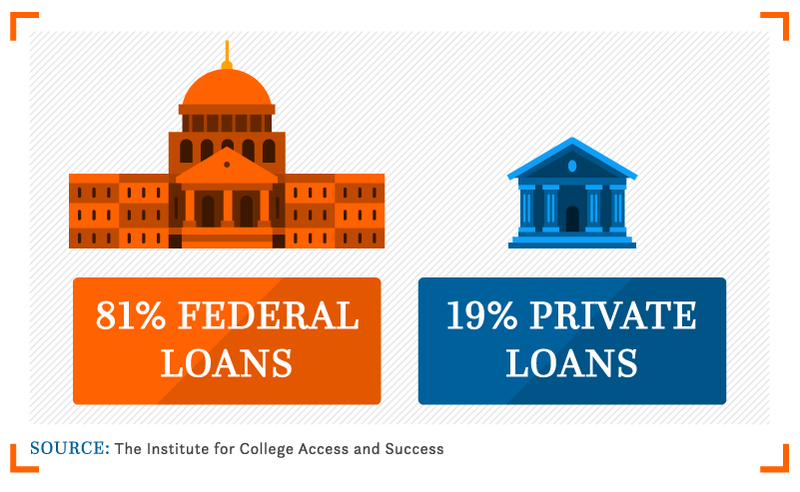 Four servicers handle the majority of federal direct loans and Federal Family Education Loans. The largest of these is FedLoan Servicing (known as AES-PHEAA), which controls 31% of the total. The others are Great Lakes Higher Education Corporation with 23%, Navient with 21%, and Nelnet with 17%. Multiple nonprofit servicers handle the remaining loans. Higher education has long been considered the ticket to affluence and job satisfaction. The earnings premium for degree holders has grown steadily over the past several decades, and college graduates are more likely to become homeowners, according to the Federal Reserve Bank of New York. Among all Americans aged 25 and older, 58.9% have spent at least some time in college, and about 32.5% have earned a bachelor’s degree or higher. Younger Americans are more likely to prioritize going to college than previous generations. Among people aged 65 and older – part of the baby boomer and silent generations – 50% have spent some time in college, and 27% have a bachelor’s degree or higher. Among those aged 25 to 34 – who would be considered millennials – 65% have spent some time in college, and 36% have a bachelor’s degree or higher. Levels of educational attainment vary widely across the country. 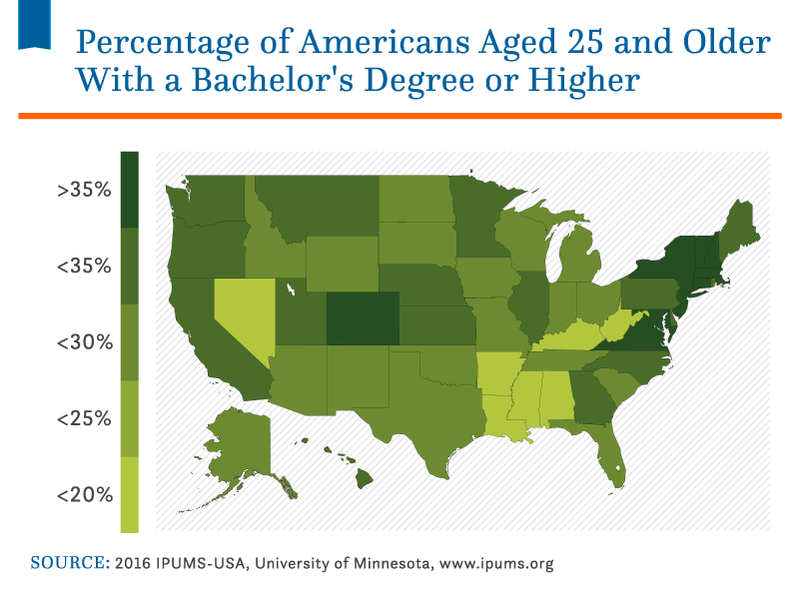 The states with the most bachelor’s degree recipients age 25 or older are Massachusetts (41.2%), Maryland (38.4%), Colorado (38.7%), and Connecticut (38.0%). The states with the fewest bachelor’s degree holders are West Virginia (19.6%), Mississippi (21.0%), Arkansas (21.5%), and Kentucky (22.7%). It’s expensive, but Americans are still pursuing graduate and professional degrees – and the majority are doing so as full-time students. 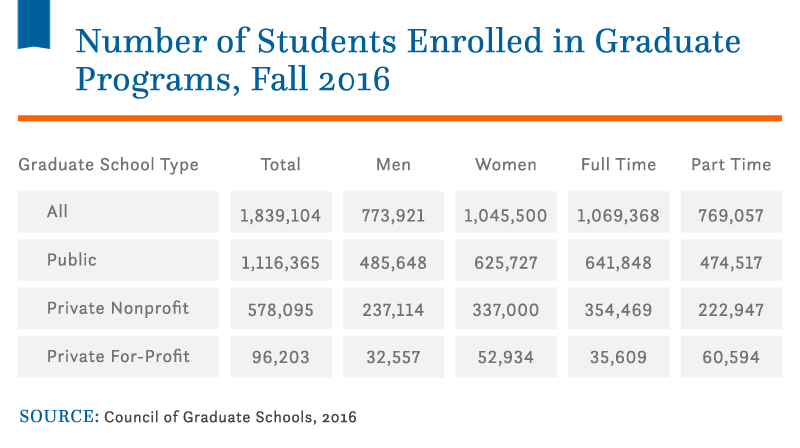 Of the 1.84 million students enrolled in public or private not-for-profit graduate programs in fall 2016, 57.4% were registered full time. Graduate students are also now more likely to be women than men. Although law and medicine draw many young people to graduate school, aspiring doctors make up just 5% of grad students and potential lawyers another 4%. 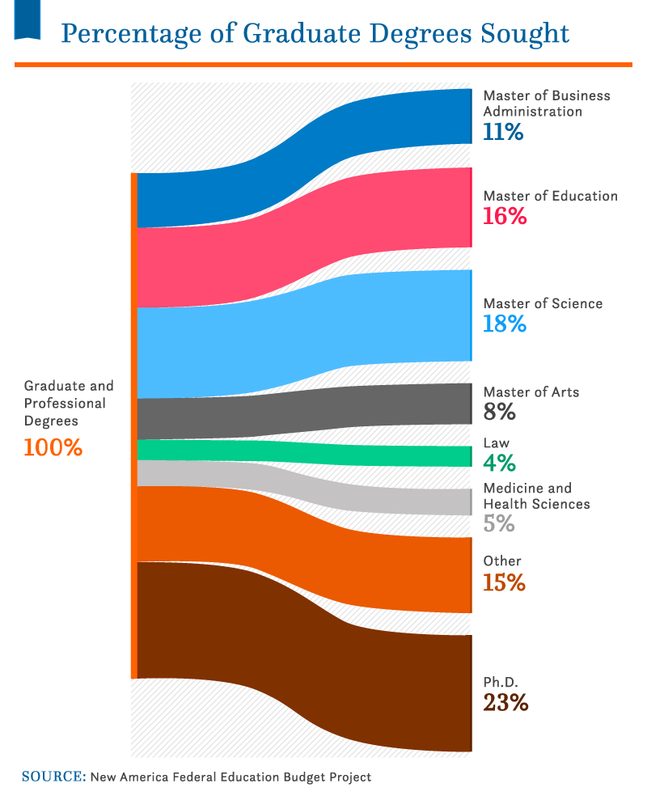 Among master’s programs, the most sought-after degrees are science (18%), education (16%), and business administration (11%). About a quarter of graduate students are aiming for a doctorate, with 23% trying to earn a Ph.D.
Of all graduate degrees, a medical degree takes longest to earn and costs the most. Doctors emerge from their training with an average debt load of $161,772. Lawyers follow with $140,616 worth of student loans, and educators rack up an average of $50,879 in outstanding loans. Of all degree seekers, the least indebted after graduation tend to be those earning MBAs, with an average student loan debt of $42,000. Many news stories about student loans seem pretty grim, focusing on the ever-higher cost of a college education. But amid the alarming statistics, there is some good news as well. Higher education is a cornerstone of the American dream and, despite the rising cost, more than two-thirds of American high school students choose to go to college. Enrollment peaked in 2011 and has declined slightly in the years since, but just over 19 million students registered for classes at degree-granting institutions in fall 2016. 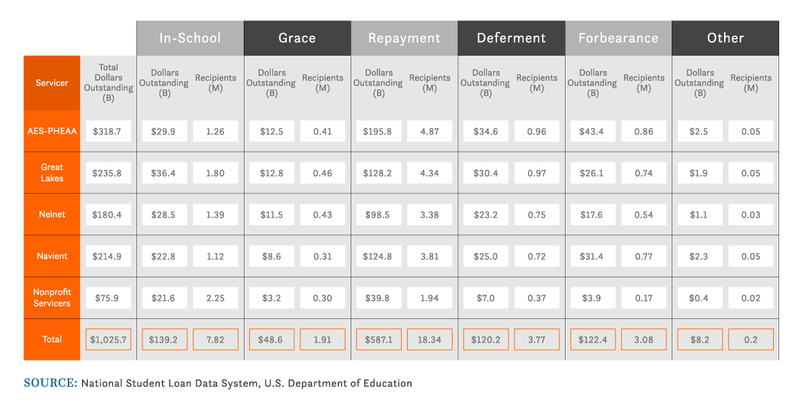 Enrollment is down at for-profit schools, and undergraduate enrollment also decreased slightly at public four-year institutions, which are widely viewed as the better value. In April 2017, New York became the first state to offer free in-state tuition at public four-year universities to residents with household incomes of less than $100,000. Rhode Island, Oregon, and San Francisco recently made community college tuition-free for residents, regardless of income. Some major companies have begun to offer student loan reimbursement as a perk of employment. To date, it’s only available at about 4% of American companies, but the number has been growing. Dozens of bills have been introduced in Congress to make college more affordable (or free) and to allow borrowers to refinance their federal loans through the Department of Education. Several provisions for federal loan borrowers, such as the student loan interest rate tax deduction, will stay in place following the 2017 Tax Cuts and Jobs Act. Even if Congress doesn’t act, there has been a surge of competition and innovation among private student lenders, resulting in lower interest rates, better customer service, and options to make loans manageable for borrowers. A recent Nitro review found people who refinanced saved an average of $253 a month and $16,183 over the life of the loan. The more debt you have, the more important it is to be strategic about paying it off. Learn more about refinancing, consolidating, or eliminating your student loan debt from Nitro. We compiled data from a variety of sources to create this report. At the time of publishing, the facts and figures included were based on the most recently available data as of January 2018. Data is subject to change as sources are updated or additional sources become available. The number displayed on the National Student Debt Clock is based on an extrapolated rate of growth in the level of student debt in the United States. Every effort has been made to ensure its accuracy, but it should be treated as an estimate only. Nitro is a free resource to help college graduates manage and eliminate their student debt. We do not issue student loans. For media outlets interested in reporting on student loan debt, we grant permission to use outright or reproduce any of the images above freely for noncommercial purposes. We just ask you please attribute Comet fairly in your coverage and provide a link to this page, so your audience can learn more about our research.